Holland Park covers an area of 54 acres, and is considered by some to be one of the most romantic and peaceful parks of West London. It is split into 3 main areas and stretches from High Street Kensington in the South to Notting Hill in the North. The northern half of the park is semi-wild woodland, the central section around the ruins of Holland House is more formal with several garden areas, and the southernmost section is used for sport. One of the parks famous features is Holland House which was originally called Cope Castle and was built as a Jacobean mansion by Sir Walter Cope – James I’s Chancellor of the Exchequer in 1606. His son, Henry, was made The Earl of Holland in 1624, and it became known as Holland House. Henry Vassall-Fox, – the 3rd Baron Holland- is the most famous political member of the family and there is a statue of him rising from one of its ponds in the woodland area i the north of the park. However it was is son who made considerable renovations to the park building the Orangery, the stables and the Garden Ballroom. The house was also very popular with artist who were collectively known as “The Holland Park Circle”. In the 1940’s it was badly damaged by a bomb and was eventually taken over by the council in 1952. Today the remains of the house form a backdrop for the open air Holland Park Theatre, which is the home of ‘Opera Holland Park’. 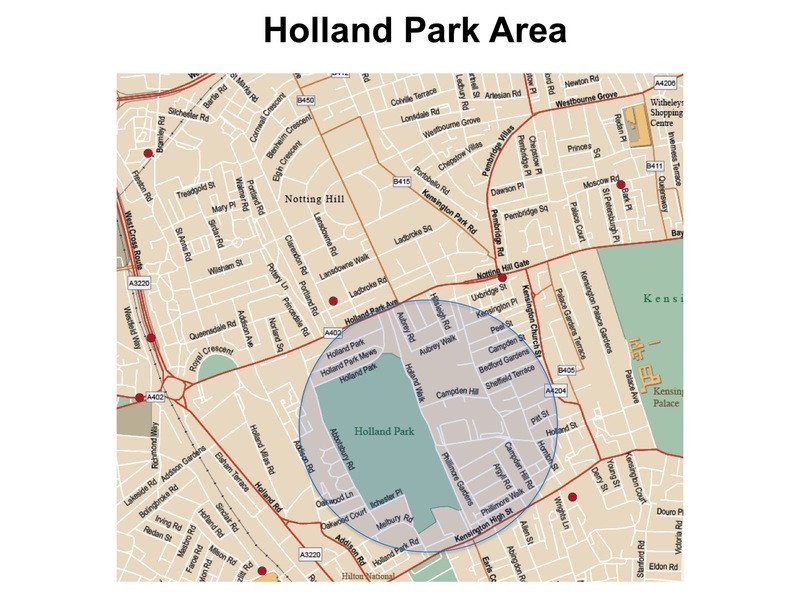 Holland Park was originally developed for upper middle class and in recent decades has gone further upmarket. Of the 19th-century residential developments of the area, one of the most architecturally interesting is The Royal Crescent designed in 1839. Today many of these four story houses have been converted to apartments and Holland Park is still one of the most expensive residential districts in London. I prefer to entre the park via Duchess of Bedford Walk with its regency house, because it brings me right into the centre of the park and next to Holland House. From there it is easy to explore the Orangery, the surrounding buildings and the formal gardens and sculptures. Heading north brings you to the beautiful Kyoto Garden which is a Japanese garden donated by the Chamber of Commerce of Kyoto in 1991. Beyond this is the wooded area of the park with its ponds and wildlife, which eventually brings you out onto Holland Park and its famous residential streets.